ST. GEORGE — The annual Winter Bird Festival kicked off Thursday, attracting both expert and novice bird watchers to the St. George area. Heading into it’s 12th year, the Bird Festival offers guided tours, educational presentations, and workshops. 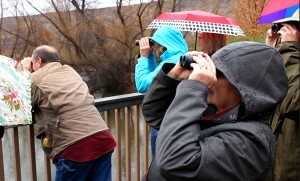 Friday’s activities included an Introduction to Birdwatching class, a guided bird-watching tour through “Local Ponds & Washes,” and a show with live birds of prey, to name a few. See a full list of offerings here. Participants’ skill levels varied from beginners to hobbyists to avid bird watchers, as they gathered together with a love for nature and all things birds. Cindy Gilmore and Wayne Peterson were attending the annual festival for the fifth time and said they consider themselves casual birdwatchers. Guided tours take place in St. George, Quail Creek, and the Zion National Park area. 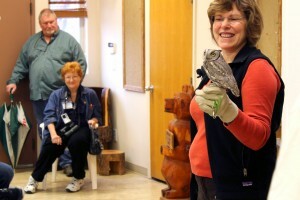 One popular presentation of the day was the “Raptor Rapture” show, led by HawkWatch International educator Janet Nelson. The guests of honor were a red tailed hawk and a screech owl. All birds belonging to HawkWatch International have been deemed unable to be rehabilitated into the wild due to injuries and are used for study and educational purposes. The Division of Wildlife Resources, Red Cliffs Audubon, the City of St. George and Dixie State University worked together to put on this year’s festival. The festival continues tomorrow, people at all levels of familiarity and expertise with birding are invited to attend.